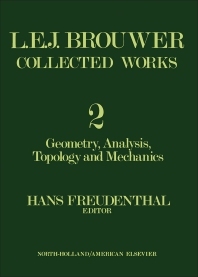 L. E. J. Brouwer Collected Works, Volume 2: Geometry, Analysis, Topology, and Mechanics focuses on the contributions and principles of Brouwer on geometry, topology, analysis, and mechanics, including non-Euclidean spaces, integrals, and surfaces. The publication first ponders on non-Euclidean spaces and integral theorems, lie groups, and plane transition theorem. Discussions focus on remarks on multiple integrals, force field of the non-Euclidean spaces with negative curvature, difference quotients and differential quotients, characterization of the Euclidean and non-Euclidean motion groups, and continuous one-one transformations of surfaces in themselves. The book also takes a look at vector fields on surfaces and new methods in topology, including continuous vector distributions on surfaces and orthogonal trajectories of the orbits of a one parameter plane projective group. The book then ponders on mechanics and topology of surfaces, as well as the motion of a particle on the bottom of a rotating vessel under the influence of gravitational force. The publication is a valuable reference for researchers interested in geometry, topology, analysis, and mechanics.